The 18 year old singer-songwriter, dancer, and actor hailing from Queensland, Australia, landed a record deal on his 13th birthday, an indisputably remarkable feat. Simpson’s claim to fame was his debut single “iYiYi” released in 2009 which features American rapper, Flo Rida. Since then, the singer and awarded swimmer began touring with iconic pop figure, Justin Bieber. In 2013, Simpson’s album called “Surfers Paradise” debuted in the Top 10 of the Billboard Top 200. In the same year, he commenced the Paradise Tour, presenting Before You Exit, Plug In Stereo, and Ryan Beatty as the opening acts. The brilliant performer infiltrated the world of dancing, as well - becoming a participant in the 18th season of Dancing With The Stars and landing a spot in the contest’s top 9. Now creating his own music independently under his own label, Coast House, Cody Simpson will release a new album entitled “Free”. The record, scheduled to be out on June 23, 2015 collates the facets of his “creative freedom”, which was, as Simpson mentioned in an interview, something he “did not think [he] could have”. The upcoming release also boasts of collaborations with Donavon Frankenreiter, advice from John Mayer, and an artwork single design by Miley Cyrus. The singer, amassing over 7 million Twitter followers and 2 million Instagram followers, is the pop voice behind the smash hits “La Da Dee” (for the movie Cloudy With A Chance of Meatballs 2), “Pretty Brown Eyes”, “Flower”, “Surfboard”, and “Home to Mama” (with Justin Bieber), among others. 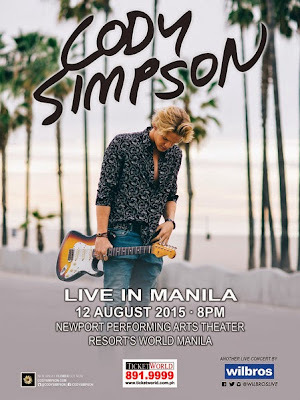 Catch Cody Simpson LIVE in Manila at the Newport Performing Arts Theater in Resorts World Manila on August 12 at 8PM, presented by Wilbros Live. Tickets on-sale beginning May 15 via TicketWorld.com.ph. Follow @WilbrosLive on social media to get updates on Cody Simpson and his upcoming concert.